I made the trip to Rosemont on Thursday evening but my lucky feelings didn’t result in any real-life finds. I took Friday morning off but decided to go to the Plateau in the evening, mostly to return to a spot where I found some mildly interesting stuff last time around. 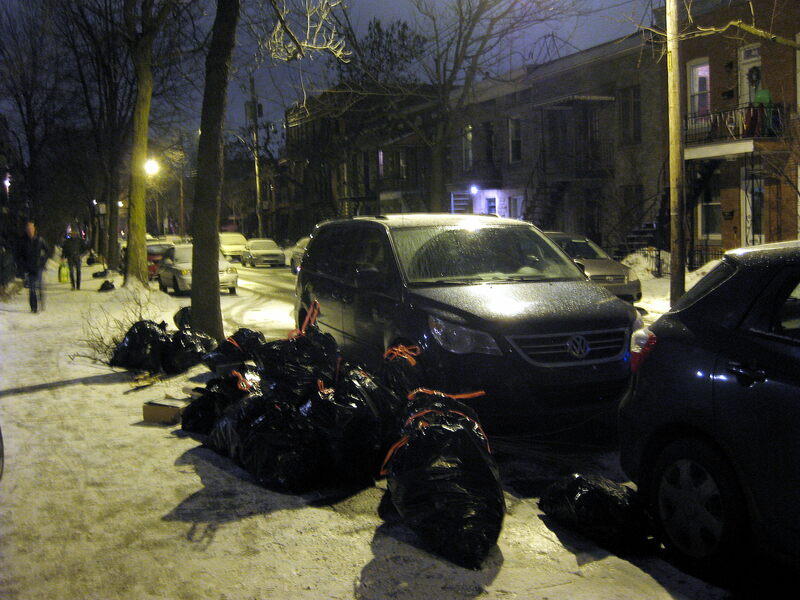 I didn’t take the route all too seriously, the Plateau being a very hit or miss place for trash – especially in the winter. I took it easy, sometimes just walking with my bike and not trying particularly hard to cover as much ground as possible. It was just a nice night to be outside. I found some pretty good stuff regardless of my casual approach. 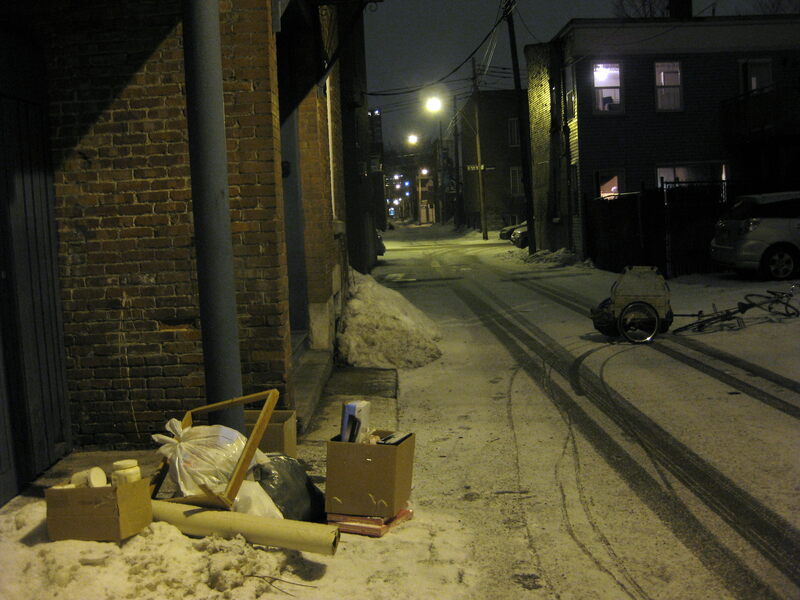 I came across this little pile in the alley north of Rachel. 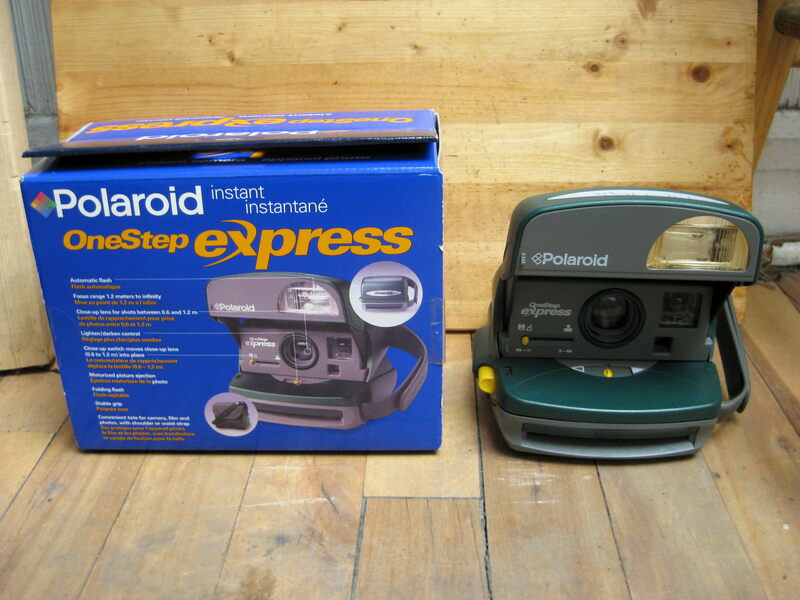 The box contained some new-looking consumer electronics, including this Polaroid One-Step camera that doesn’t look to have ever been used. These seem to sell on Ebay for around 15-25$, though there’s some that have sold in the 75-90$ range as well. Seeing as this machine is cosmetically perfect I wouldn’t be surprised to make something close to the higher amount. The DVD player also looks to be new – I found it in it’s original box complete with styrofoam protectors. The VCR is obviously more “vintage” but is also in good shape. Both units turn on and I suspect that they work fine. 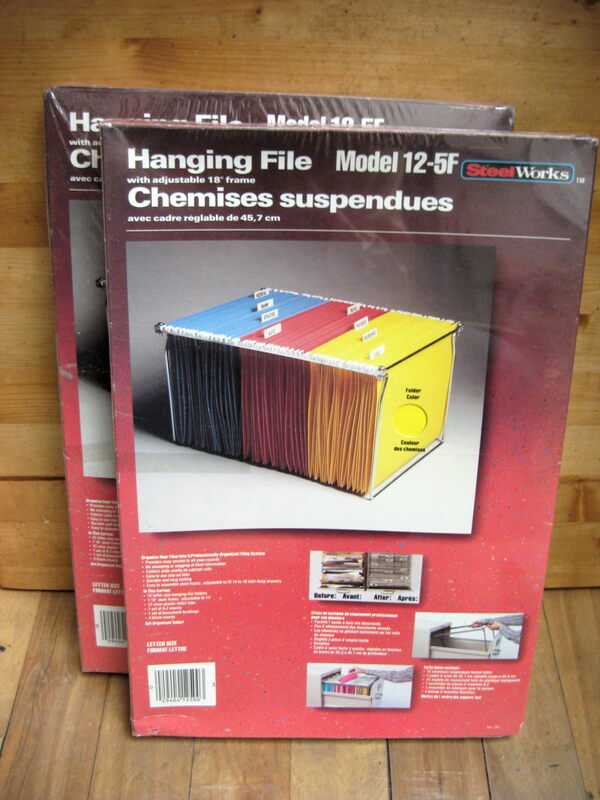 Underneath the box were these two hanging file organizers, both still wrapped in their original plastic. The abundance of new-looking things makes me wonder if these people were throwing away unwanted Christmas gifts. I later moseyed on up Lanaudiere, stopping when I came across this larger-than-usual accumulation of trash. A neighbour noticed me and noted that the bags contained “les trucs de démenagement” (basically, things left behind from a move). 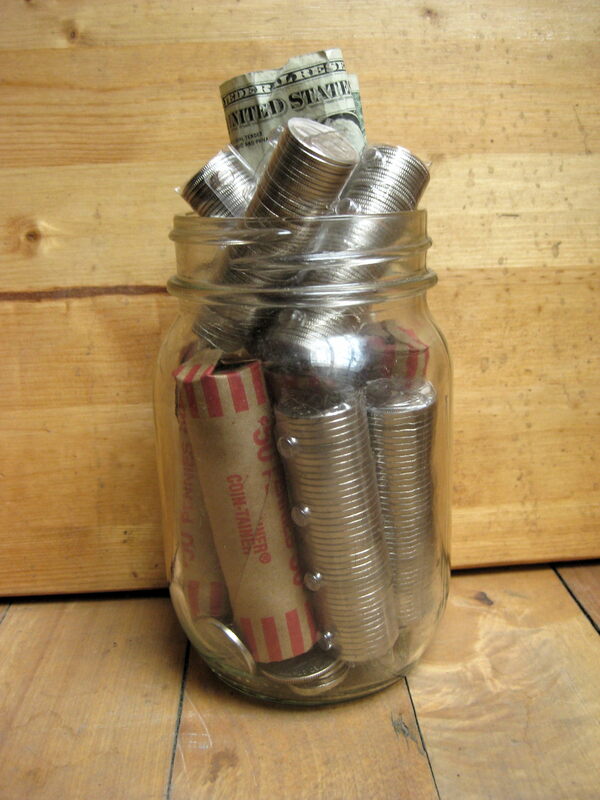 …a jar full of change! I had indeed recognized that familiar rattle of coins against glass. (FYI: It wasn’t rolled when I found it, I did that with the help of a couple of friends last night). Overall there was around 25$, not including two American 1$ bills and 2 British pounds. 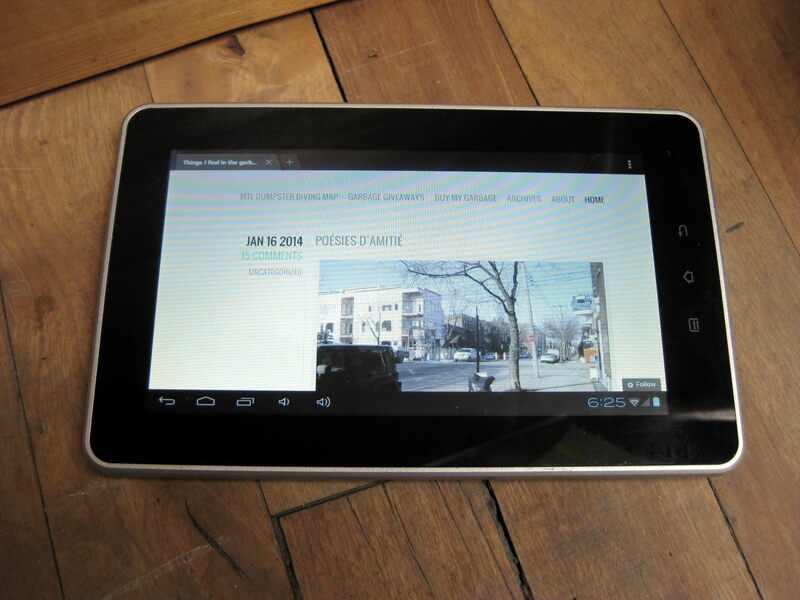 Inside another one of the black bags was this fully-functional Android tablet. Don’t let the lines on the screen fool you (that’s just because it’s hard to take pictures of screens) because this machine is in perfect condition. It looks like the owner might have used it maybe once or twice. The battery was dead when I found it but I luckily had the right cable to charge it with. It isn’t as fancy as an iPad (which the person might have replaced it with, I seem to remember finding an empty iPad box). However, it still runs pretty smoothly, connects to the internet, and is fairly modifiable. It’s basically like a little computer, though obviously underpowered for more demanding tasks. Still, I could likely use this to go to a café to write a blog post if I wanted. If I were to sell it it’d be worth around 50$. I could write about how crazy it is to throw out working computers and jars full of change. I’m sure you already know, however, so I’ll leave it at that! Next week is nearer to the end of the month so hopefully the good finds continue. It’ll be colder but not outrageous as it was not long ago. At the very least I want to make it to TMR on Wednesday and Rosemont on Thursday, in all likelihood though I’ll do more than that. I’ll let you know if I find anything! Good finds. I can’t conceive of how people throw out such things (or most of the things you’ve found over the past 1+ year, actually). I expect most of the time, it simply boils down to pure, unadulterated laziness. Never fails to amaze me! Wow! This blog makes me look at garbage so differently now. The more effort you put it, the better the results, as proven by pictures above! Bravo! Great finds! I have to drive around to make my finds as I live in a pretty well spaced out rural area. I’m sure I’m missing a lot of good finds this way, but still amazed at what I do find. I am curious if women who forage trash tend to pick up different stuff than you.Also I am wondering if older people are more likely to rescue certain items than younger people.I am actually quite surprised that many,many of the people who leave great comments on your blog do not live in Quebec nor have ever lived here. I don’t see a lot of women doing it. I see older women collecting cans, and when McGill lets out, women are often part of teams carrying furniture around (so it’s not clear if they are moving from one apartment to a near apartment or bringing something home to use). The one time I really remember a woman looking for stuff, it was a pile of computer junk I was looking over. But she didnt’ have her own tools with her to open up the computers and take the useful things. I’ve talked to women who do it, it just coming up for some reason, but in at least two of the three cases I am thinking of, it seemed to be about furnishing a new apartment. I think people often go out looking for specific things. Yes, there are some people who are out looking for items they can resell, even if it is cans, but I think for many it’s a smaller scale. They are looking for things for themselves, or things they can handle and resell. The times I see the most people out are when McGill lets out, and around July 1st. And I always worry about what I might have missed (and you really never know) but lots of times I find things I want despite the “crowds”. A lot of things Martin writes about here, I wouldn’t even notice. I took that roll of Canadian Tire money when I found it, but I’m not digging looking for money or gold. I would argue I see more electronics than Martin, but that’s what I’m looking for. had VCRs built in (and that time I found the DVD recorder in a recycling bin). I havent’ seen VCRs in a while, but then I brought home a few at one point as spares for watching commercial VHS movies (because at this point I have a large collection of VHS movies bought at garage and used book sales) and wouldn’t want to pay full price (if I can still buy a new VCR) if the current one breaks down, So since that need is satisfied, I may not notice VCRs anymore. The tablet is a pretty unique find at this point (especially since it’s not broken), it seems a tad early to find those in the garbage, though low megapixel digital cameras do appear. Some people can only deal with cans, someone else might pay attention to DVDs (for themselves, or to resell). Some people are only interested in food, but that gets a lot of coverage in old media, so I’m not sure if it reflects a reality or just that the notion of pulling food from the garbage is more “newsworthy” than finding a DVD player. Or maybe it reflects people needing food, while many can’t do anything about electronics. Or some people will talk about finding furniture, which has to be really easy since it’s not likely to be hidden in garbage bags or boxes, but also, that’s within a lot more people’s range than something more exotic. If you have no money at all, food may be the most immediate thing. But if people are going out and buying new things that they could find in the garbage, it makes more sense to find those things in the garbage and then use the money on things you can’t find. The most valuable things I’ve found, if the least interesting, are the things I was just about to go and spend money on. I didn’t need an LCD monitor, but I was thinking about it some years back, and finding one on the sidewalk meant I could spend the money on something else that wasn’t showing up as garbage or used. It’s true that I don’t show everything, only the things I find interesting or the things that fit a narrative. 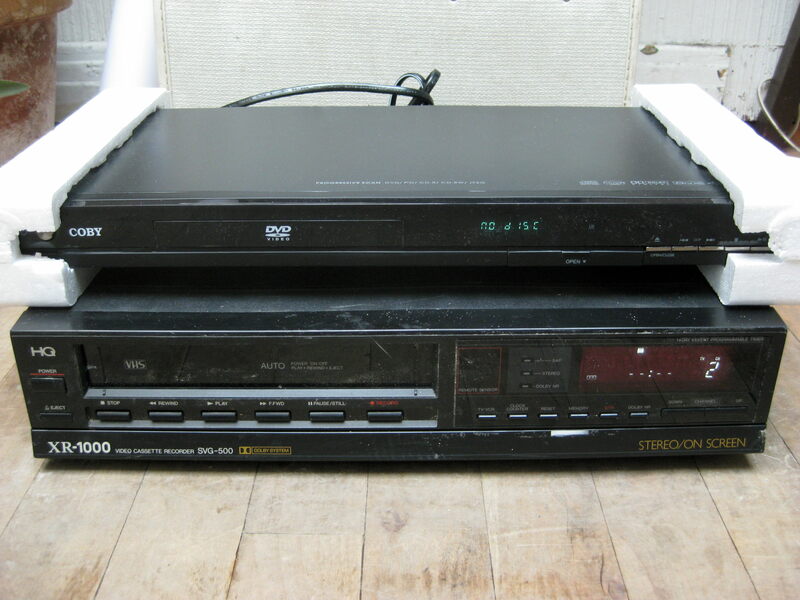 I see DVD players and VCR players all the time, for example, though I very rarely take them (I don’t use them, they take up a lot of room and are frequently broken). These ones would have never made it to the blog if I hadn’t found the other good stuff, including the camera, change, and tablet, to complete an interesting narrative to the post. My focus is definitely towards older/vintage/antique items (including electronics at times) because they interest me most. However, I think I understand the value of things generally enough to take a wide range of other stuff (broken cell phones, etc). I’d love something like that, I’d imagine it costs a few grand at least though… maybe one day! company’s Copenhagen showroom, and should be ready to ship to other markets as of this spring (Northern Hemisphere). Prices for the Mk1 start at 3,395 (about US$4,600), with the Mk1-e entering at 4,995 ($6,770). The object of 10 cm silver, This is to buffer wax to seal a letter.